On left-Ebenezer Baptist Church is a living tribute to the life and legacy of Dr. Martin Luther King Jr. It is where he was baptized, ordained and served as co-pastor with his father until 1968. The church played a valuable role in influencing Dr. King’s Christian values and his pursuit of justice and equality. 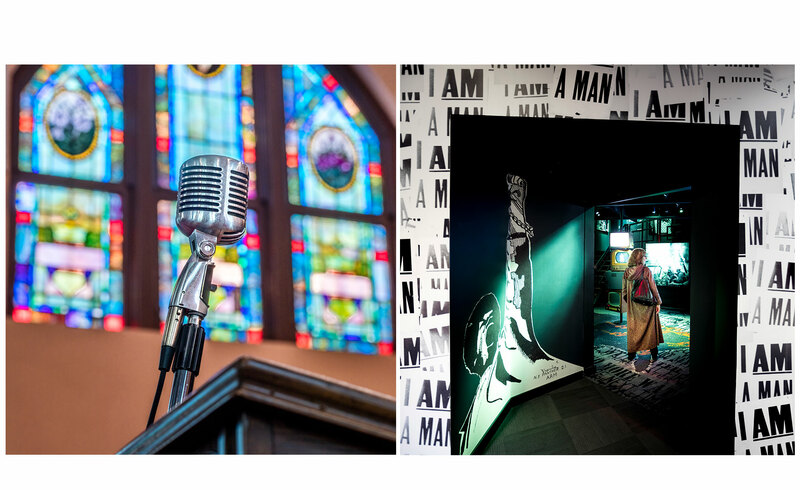 The church is part of the Martin Luther King Jr. National Historic Site and is still active today as a thriving ministry that connects with visitors from around the globe both in person and virtually through its digital home, Ebenezer Everywhere. On right-The National Center for Civil and Human Rights is a multicultural center with exhibits highlighting the Civil Rights Movement and the modern human rights movement. Exhibits include Sports and Change, Morehouse College and Dr. King.